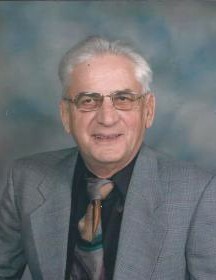 Obituary for Alfred Paul "Eddie" Elsasser | Binkley's Funeral Service Ltd. It is with great sadness that we announce the passing of Alfred Elsasser, November 23, 2018 at the Leader & District Integrated Health Facility with his family at his side. He was Born Dec. 7, 1941 (notably the day Pearl Harbour was bombed)at the family homestead near Estuary (where Daryl and Raylene reside today). He was educated at Estuary school. He met Sandra in 1962, and married the love of his life Feb. 22. 1964. The births of Shelley, then Daryl were soon to follow. The family moved to Moose Jaw for a short time for Alfred to attend carpentry school. Once back in Leader, Leanne arrived, and there they continued to raise their family. Through those years, Alfred continued to farm, and worked in carpentry, first with Guckert Construction and later formed his own business with his brother-in-law Gary Gill. He then worked for various construction companies in Leader, building Leader Composite School and the Western Senior Citizens Home addition. In Alfred’s younger years, he loved to hunt, fish, camp and play cards. He was very talented using his God given gift of woodworking and gadget building to make numerous lovingly made creations for his wife, children and grandchildren. In his later years he loved to visit with family and friends especially his 7 grandchildren and 3 great children, but still loved to tinker as much as his disability allowed for hours on end. Alfred was predeceased by his parents(George and Christina Elsasser), brother ( Paul and Harvey Elsasser), brothers in law (Leonard Braun, Chris Nagel and Robert Nagel), sister-in-law ( Carolle Elsasser) and mother and father in law ( Martin and Clara Gill ). He is survived by his wife, Sandra of 54 years; children Shelley(Barry), children Amie (Kyle) Christie and Jory( Shantel) Miller; Daryl (Raylene) children Lynnea and Jarryd(Samantha) Elsasser; Leanne(Kim)Watts children Jayelle, Aaron and Evan. Great grandchildren Deakon and Holdyn Christie and Westyn Elsasser. Also Sisters Martha Nagel, Esther Nagel and Freida Braun. Brother Harold(Florence) Elsasser. Sisters in law Doreen ( Art) Coward, Phyllis(Bob) Healing and Eunice Gill. Brother in law Gary(Janice) Gill. And 36 nieces and nephews, every one of which held a very special place in his heart. Funeral service held at Leader Alliance Church on November 27, 2018 at 10:30 am.